Help, my Mum & Dad are toxic & causing too much pain. How do I let go? Clients often battle over society’s pressure that you must look after their parents versus the fact their Mum and Dad is toxic and malicious and causing them too much pain. The guilt of this keeps them maintaining a relationship with your parents, even if it draining to them. This in turn causes them various negative emotions often leading to depression. Clients struggle as they want to believe in their heart and mind that their parents love them but in reality they know it isn’t true. In fact the relationship is toxic to them. But how do they let go? Often when you grow up thinking your childhood was good, it is difficult to come to terms that this may not be the case. When clients start to unpick the years of guilt, frustration, manipulation, emotional abuse or even relationship break-ups, they being to understand that they parents have been the cause of a lot of unhappiness and emotional pain. It is hard to face the reality that your Mum and Dad are toxic especially if when they are feeling guilty, insecure or anxious. Clients bring different scenarios of parents who cause them a lot of heartache. Often adult clients talk about parents who constantly put one child against another. Clients can feel inferior to their siblings and no matter what they do; they will never be good enough. If parents are unhappy, clients have talked about how they try to make the life of the client unhappy. It feels they are dragging them into their own misery. As a result they can never be happy for their child and only negative. Often clients talk about parents who seem to have pleasure in putting them down and making them doubt themselves. Parents who struggle with their adult children and are jealous of them, leads them to be resentful of their successes, relationships, family or lifestyles. Realising that your relationship with your parents is not healthy can be a huge burden. It carries guilt. We are embarrassed to talk about the relationship let alone thinking that we could end it. Relationships with our parents are seen as an obligation or one that we are trapped in. We shouldn’t think of our parents in that way. Yet, if we realise our partners are emotionally abusive, it is acceptable to walk away from it but generally society says that you should do all you can for your parents. The guilt is made worse if your parents are seen by others as loving, kind, generous and funny. Yet, you know different. If your parent constantly putting you down or is impossible to please or is malicious towards you or even interferes into your relationships, it can be draining. You can try to reason with them but often that fails. Trying to love them harder will not make them change their behaviour or approve of you. You cannot control how someone behaves with you; you can only control how you react to it. Before you break ties with your Mum and Dad, you may deal with a lot of tears and have to ‘let go’ of the dream of living in a close, loving relationship. This in turn will bring feelings of grief and loss. You may even loose relationships with other members of your family. To do it, you need to decide what sort of relationship you want and how you will protect yourself with your decision. I often encourage clients to write a letter (not to send) to their Mum or Dad. This helps them get all their emotions out and to start thinking about what they need to let go off. Once they have done this, remembering that clients are responsible for your own happiness and not your parents. I ask them to think about what will make you happy? What are the reasons for your parents causing you too much unhappiness? You can then ask yourself, what can I do about it? 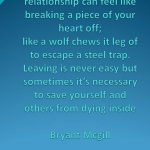 Will it be easier to withdraw and set tight boundaries or do you need to cut all ties? Whatever decision you make, you have to do what feels right for you and what will make you happy. As soon as you start to feel guilty, you will be caught in the trap of doing what will make your parents happier. This step of learning not to live with guilt and to focus on their own happiness is very difficult for clients. However, once that have made the decision of ‘letting go’ or even breaking relationships with their parents, clients are able to look forward. They feel freer and much happier. They can start reclaiming back their own life and no longer live in a toxic relationship.